Tom Walsh returned from injury as a substitute for Caley Jags. Walsh’s volley nine minutes from time marked an excellent return from injury following a month on the sidelines, securing a third straight victory for the Highlanders after Aaron Doran’s opener had been cancelled out by Stuart Bannigan. 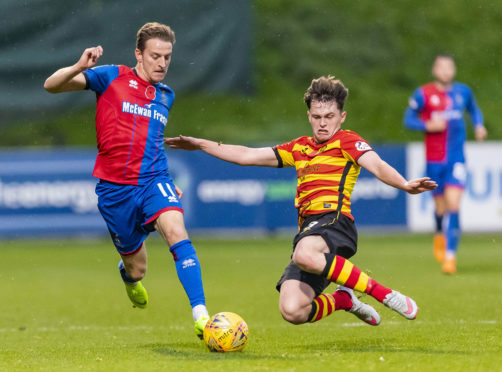 Caley Jags remained unchanged for a third straight match, against a Jags side desperate to claw further away from the bottom of the table having jumped above Alloa Athletic into ninth. It was the visitors who created the first meaningful opportunity, with Carl Tremarco seeing a shot held by Jamie Sneddon after running in on goal on 11 minutes. Thistle tested Mark Ridgers for the first time moments later, with veteran attacker Scott McDonald seeing his effort from the edge of the box comfortably gathered by the Caley Jags goalkeeper. Opportunities dried up for both sides however Inverness finished the first half strongly, with Joe Chalmers seeing an effort from the edge of the box tipped over by Sneddon, before Aaron Doran dragged a low effort wide of target from an acute angle moments later. The best chance of the first half came Inverness’ way on the stroke of half time when Jamie McCart’s header was thwarted by a fine low save from Sneddon, with Tremarco unable to tuck home the rebound. Thistle thought they had drawn first blood shortly after the interval when Steven Saunders prodded home from point blank range after McDonald’s shot broke his way, however he was denied by an offside flag. The game burst into life when Inverness took the lead courtesy of a superb goal on 65 minutes, with Jordan White’s dummy from a Tremarco through ball teed up Doran to go through on goal, and he showed composure to coolly slot past Sneddon. It proved a short-lived advantage however, as Thistle equalised within three minutes. McDonald’s lay-off set up Bannigan, and the Jags skipper produced an excellent left footed finish which curled into Ridgers’ right hand corner. Inverness regained the lead in superb fashion nine minutes from time, with Polworth’s ball over the top picking out the run of Doran, who in turn fed Walsh to rasp a thumping volley past Sneddon from just inside the box.